The Wayzgoose Book Arts Fair! 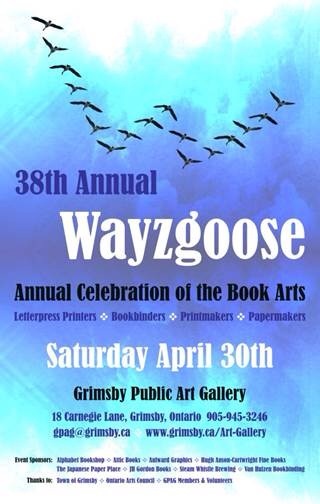 This Saturday is the 38th Wayzgoose Book Arts Fair! Come out and join us for a great day celebrating all things bookbinding, printmaking, papermaking, letterpress, and paper arts!! This entry was posted in Artists Books, Book Binding, Show, Wayzgoose and tagged book arts, book arts fair, bookbinding, grimsby, handbound books, spring events, sprouts press, sproutspress, wayzgoose by sproutspress. Bookmark the permalink.